When it comes down to it, this book is a story about a monk with an umbrella. Certain other monastic figures are lionized, even canonized, because their lives have been made so outsized. This may be due to their extensive writing (Thomas Merton) or their treasured wisdom (Richard Rohr) or the impressiveness of their embodied devotion (St. Francis). People of faith pay attention to and draw inspiration from these few, perhaps in part because we can't imagine leading the life that they did or do: who among us but a select portion could envision a cloistered life of a regular prayer and work schedule, with limited contact with the outer world? The ones I've mentioned, of course, transcended that contact. That is why we know them. But we forget the hundreds or thousands who go about their days in quiet service, never publishing books or starting their own movements. They rise each day, called by the bells to prayer, or to meals, or to chores, or to assist guests on retreat, and they are content to do that without the added attention that some have drawn for various reasons. 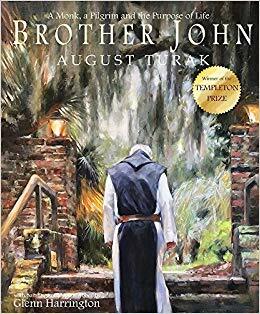 Brother John by August Turak is the story of one such monk. Turak meets him while attending a time of retreat at a Cistercian monastery called Mepkin. After the evening Christmas Eve Mass and subsequent party, Brother John greets him with an umbrella, ready to walk him back to his room. This small and seemingly insignificant act of service is enough to inspire Turak to reflection. Brother John is apparently a notable figure at his monastery simply because he goes about his duties so faithfully. He changes light bulbs, he pitches in when others are short-handed. He's just living his life, but these small, quiet actions catch Turak's notice enough to wonder at how he himself may serve in his own way and in his own life. What does a life of unheralded and deep faith look like if it isn't one like Brother John's? This seems to be the question at the heart of Turak's story. It isn't very long. It's a few hundred words, less than 50 pages in length, accompanied by beautiful painted illustrations. But the reflection it may cause in the reader has the potential to last much longer and delve much deeper. All this because of a monk with an umbrella. Which, if you think about it, is all one may need.